The past year has been a tough one for friends of a free Cuba. 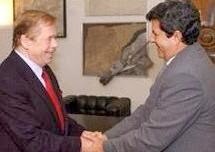 There have been great losses: the academic, Juan Clark, the comedian, Guillermo Alvarez Guedes, the former chairman of Bacardi, Manuel Jorge Cutillas, the Christian Democrat and intellectual, José Ignacio Rasco, the human rights defender Martha Frayde, and now the former prisoner of conscience Antonio Augusto Villarreal Acosta. The majority of these Cubans died of natural causes, but two stand out: Juan Clark and Antonio Augusto Villarreal Acosta. Both apparently committed suicide. Cuba shares a dubious distinction with Uruguay as having the highest suicide rates in the Western Hemisphere. I have never been able to condemn suicides; instead, I tend to respect them, not only for the undoubted courage needed to commit suicide, but also because suicides place the value of life very high: they think that life is too precious a thing to permit its devaluation by living pointlessly, emptily, without meaning, without love, without hope. Sometimes I wonder if suicides aren't in fact sad guardians of the meaning of life. Psychologists have reported that there is an inner voice that drives a person to suicide and offer therapies on how to combat it. One cannot dismiss this as simply the result of a mental disorder, but rather a combination of factors. Hopelessness in combination with depression or other disorders can lead to suicide. Other studies have demonstrated a specific relationship between suicide and hopelessness otherwise known as despair. Within the Cuban context, a society where totalitarianism has permeated every corner of existence (including familial relationships), despair is one of the few resources in great "abundance" in Cuba. This leads to the obvious question: How does one confront despair? The kind of hope I often think about (especially in hopeless situations like prison or the sewer) is, I believe, a state of mind, not a state of the world. Either we have hope within us or we don't. Hope is not a prognostication — it's an orientation of the spirit. Each of us must find real, fundamental hope within himself. You can't delegate that to anyone else. Hope in this deep and powerful sense is not the same as joy when things are going well, or willingness to invest in enterprises that are obviously headed for early success, but rather an ability to work for something to succeed. Hope is definitely not the same thing as optimism. It's not the conviction that something will turn out well, but the certainty that something makes sense, regardless of how it turns out. Havel here reaches far back into antiquity and offers a meditation on hope that the Stoics would have embraced. Hope as defined here by Havel is internal not external and offers those confronted with hopelessness with the tools to battle that inner voice of despair with the power of living with conviction in truth. In the case of Cuba where the secret police is out to destroy you in body and spirit such tools are a necessary part of physical and spiritual survival. In the meantime my prayers go out to these dear departed and especially to Juan Clark and Antonio Augusto Villarreal Acosta. "Eternal rest grant unto them, O Lord, and let perpetual light shine upon them. May the souls of the faithful departed, through the mercy of God, rest in peace. Amen." Today, December 28, 2013 Chinese dissident and Nobel Peace Prize Laureate Liu Xiaobo is observing his 58th birthday and his fifth behind bars in a Chinese prison. He is a prisoner of conscience imprisoned in 2008 for his participation in the drafting of Charter 08. His wife, Liu Xia, has been under house arrest since 2010 when her husband won the Nobel Peace Prize. "There are laws but there is no rule of law. There is a constitution but no constitutional governance. And there is still the political reality that is obvious for all to see. The power bloc continues to insist on maintaining the authoritarian regime, rejecting political reform. This has caused corruption in officialdom, difficulty in establishing rule of law, and no protection of human rights, the loss of ethics, the polarization of society, warped economic development, damages in the natural and human environments, no systematic protection of the rights to property and the pursuit of happiness, the accumulation of countless social conflicts, and the continuous rise of resentment. In particular, the intensification of hostility between government officials and the ordinary people, and the dramatic rise of mass incidents, illustrate a catastrophic loss of control in the making, and the anachronism of the current system has reached a point where change must occur." South Florida residents have the opportunity until March 16, 2014 to see first hand the consequences of corruption in officialdom and its impact on Chinese children. Although not necessary, would also recommend viewing the documentary Never Sorry exhibited at the Miami Film Festival in 2012 and later that same year at the University of Miami. The film provides context in which much of the work of this Chinese artist's exhibit was made. 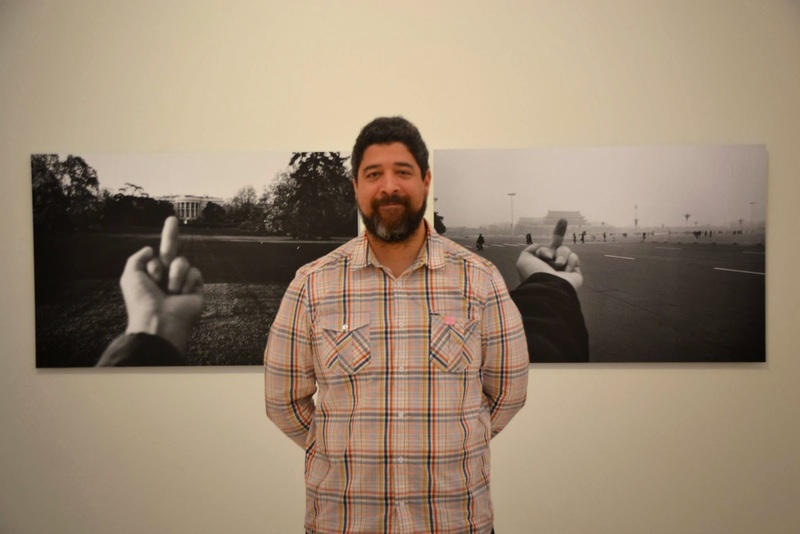 Ai Weiwei: According to What? at PAMM Photo by P.U. 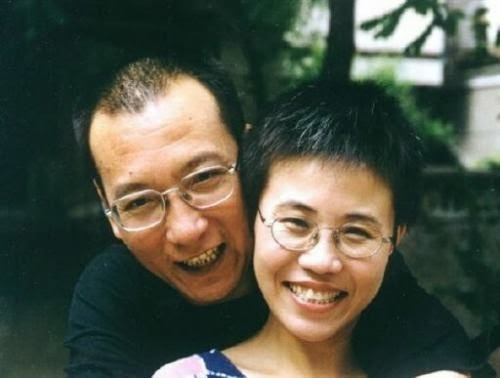 In the meantime take a few minutes out of your day to petition the Chinese authorities to free Liu Xiaobo while at the same time remembering that he is not the only one imprisoned for his beliefs. 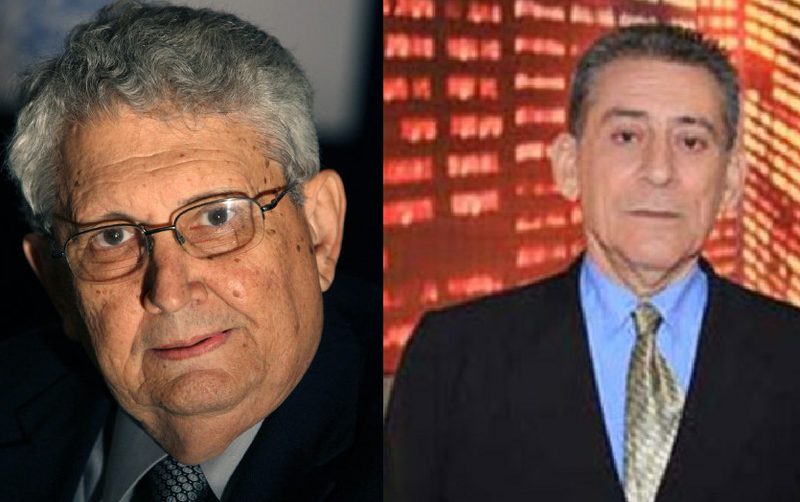 15 months later in the middle of a human rights crackdown in Cuba another sad anniversary is marked and the call for solidarity and an end to impunity in the suspicious deaths of human rights defenders Oswaldo José Payá Sardiñas and Harold Cepero Escalante continues. "Yesterday, December 22. 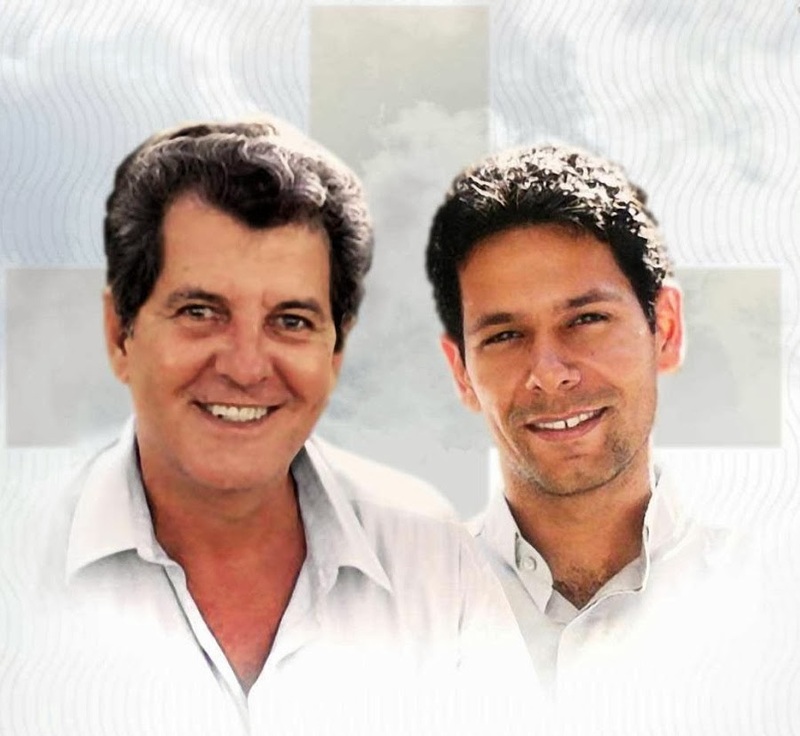 1 year and 5 months have passed since the unclear deaths of Oswaldo Payá and Harold Cepero. We renew our call for an independent investigation, because it is just, necessary and also for an end to impunity. The Cuban people know it was not an accident, which contrasts with the regime's refusal to tell the truth, the complicity of other countries to hide and even coldness (including even the hot cloth or caressing equidistance of ears) ..."
17 months ago on another Sunday, around this hour a Cuban government state security car rammed the car in which my dad traveled. Today marks 17 months, yes they were alive and well after State Security rammed the car. How did my father and Harold die? What would be the best way to remember Václav Havel on the second anniversary of his passing? Some began a new tradition last year, inspired by the beginning of his presidency, when Havel appeared in public several times wearing noticeably short trousers, of wearing rolled up trousers and are repeating it again this year. Perhaps another would be by listening to the words of one of the individuals who represent a movement that sought to live in truth and counted on the Czech dissident's support. On September 15, 2013 at the Prague Crossroads in the opening ceremony of the 17th Forum 2000, Aung San Suu Kyi spoke about her appreciation for President Václav Havel and his active solidarity over the decades for freedom in Burma. Below is the video and text from the event. Aung San Suu Kyi: Thank you. It is indeed a signal honor to be able to speak some words of appreciation about the late President Václav Havel, a great man and a true friend of the movement for democracy in Burma. He kept the flame of hope alive for us during our most difficult times, and we will never forget him. So much has been said about him and written about him that there is very little, I feel, that I can contribute towards his memory, but yet I would like to make an effort because what he did for Burma and for human rights and for democracy, all over the world, is so vast that I think there will never be a time when we can stop talking about it. Of course, all of you know that it is thanks to him that I was awarded the Nobel Peace Prize and I have never made a secret of the fact that if instead of nominating me he had accepted the nomination for himself, he would have been the Nobel Peace [Prize] Winner of 1991. I will always believe that because I think that was the truth – and he believed in truth, facing the truth. I have tried to look at different aspects of his life and of his work for human rights and for democracy and wondered how I would like him to be remembered in my country and in other countries where democracy and human rights are valued. I see him primarily as a man who loved freedom. That is so important for us – freedom – and when I say that he loved freedom, what I mean is that love entails cherishing, and cherishing entails enhancing. He loved freedom, he cherished freedom, and he enhanced freedom because he lived his ideas and his beliefs as few other people have lived. When I was under house arrest for many years in Burma I knew that somewhere in the world there was a man who was speaking out for me and because of whom my freedom remained intact, in spite of physical detention. He made me feel free, because he was free and he believed in the right of every human being to freedom. When I say that he cherished freedom I mean that he knew the value of freedom. He knew how to value freedom. He did nothing that would take away from the value of freedom. Many people have committed crimes in the name of freedom; this was not the kind of thing that Václav Havel ever did. Whatever he did enhanced the value of freedom, made us understand what freedom truly was. The ultimate freedom was that of “living in truth,” the kind of freedom that can never be taken away from any of us. Because he believed in freedom, he believed in living in truth. If you cannot live in truth, if you cannot live as you believe you should live, you are not a free person, even if you are not physically detained in any way, even if you think you can do anything you like. But as long as you do not have courage to face the truth and live the truth, you cannot truly be a free person. And that is what he taught me, and I am sure he taught this to others as well: that to be completely free you have to be true to yourself and to your beliefs. We in Burma have started out on the process of transition, which is why it is so appropriate that I should be able to come here today and thank the man who made it possible for us to keep alive our belief in our ability to effect transition from military dictatorship to democracy. We have not effected this transition yet. We are still in the process of trying. And if he were alive today and here with us, I am sure he would say to me – to all of you – it is not going to be easy but you persevere and you will get there. And this exactly what I believe. It is not going to be easy and we have just started out. I have repeatedly spoken out against over-optimism because that could make us complacent. It could cause us to lose the way. It could cause us to stumble. We have to forge ahead with our eyes open, recognizing the difficulties that lie in our path and facing the truth as President Václav Havel would have wished us to do. I do not think he would have approved of blind optimism. He would have wished us to face our problems fairly and squarely and to cultivate the courage and the capacity to overcome these problems and meet our challenges successfully. When I was under house arrest in Burma, I used to think of Czechoslovakia, as it was then, as a faraway friend on whom we could always rely in times of need. I knew that some of our dissidents were given sanctuary in your country, and I knew that all the time your leader was speaking out for us, for me, for our country, for democracy, for human rights. When I received his books – I was allowed to receive books from time to time – I read them avidly to try to find out how I too could survive the years of struggle as he survived, and that is when I understood that the ultimate freedom was to be able to live in truth. And that is what we are still trying to do in my country. We want to live in truth. We want to live as we believe we should live as human beings, in harmony with one another, with courage, with hope and with the desire to share whatever goods may come our way with others – not just others in my country but with others all around the world. And now that I am here in Prague, I would like to share with you our deep gratitude to President Václav Havel and all those people in your country who have stood by us and who, I know, are still standing by us in this time of immense challenge. Cuba has suffered under a totalitarian dictatorship for the past 54 years and the consequences to children have been incalculable. 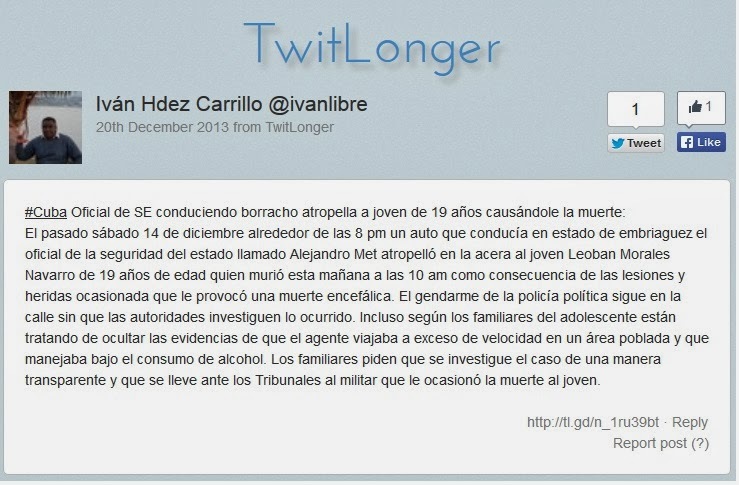 Below is a report from Iván Hernandez Carrillo about how children are penalized for not going along with the Castro regime's acts of repudiation against nonviolent dissidents. Pledge regime requires of entering high school students in Cuba who want to teach: "Feel vocation for teaching, being aware that once passing grade 12 and the three entrance tests I can only choose teaching careers." and further on "free from any disease, physical limitations, mental, political or religious preventing me from training as a patriotic student" and that I must be "unconditional to the tasks and duties assigned to me." Below is a real world application of this pledge. Last Wednesday December 11 the professor Peñalver of Military Training at the Leonel Fraguela Pre-University of Colón met with the parents of students of that school to threaten them for not letting their children go to acts of repudiation against the Ladies in White on Sundays. This professor told them they would lose points in the evaluation and thus lower the grade point average and may even fail the course; however those who attend will be awarded 100 points on average. The parents objected but the professor threatened to suspend them. This was in response to last Sunday when parents forbade their children to repudiate the Ladies in White. Repression in neighborhood of Miramar in Havana, Cuba on December 10 using children still in uniform to disrupt dissident activity in celebration of International Human Rights Day. El pasado miércoles 11 de diciembre el profesor Peñalver de Instrucción Militar del Pre-Universitario Leonel Fraguela de Colón se reunió con los padres de los estudiantes de esa escuela para amenazarlos por no dejar ir a sus hijos a los actos de repudio contra las Damas de Blanco los domingos. Dicho profesor les dijo que perderán los puntos de la evaluación y así bajará el promedio académico y pueden hasta desaprobar el curso sin embargo los que asistan el le otorgarán los 100 puntos de promedio. Los padres se opusieron pero el profesor los amenazó con suspenderlos. Esto ha sido en respuesta a que el domingo pasado los padres le prohibieron a sus hijos repudiar a las Damas de Blanco. 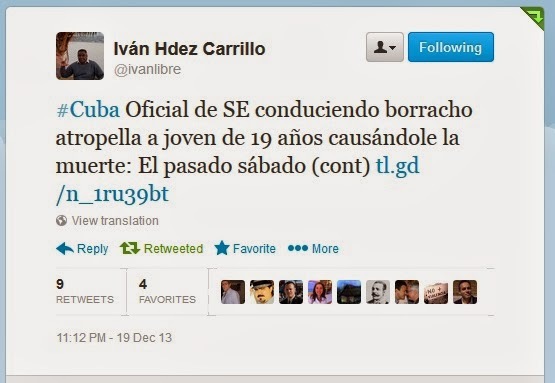 CLAIM #1: Castro brothers have used the embargo as an excuse of their disastrous misrule in Havana. 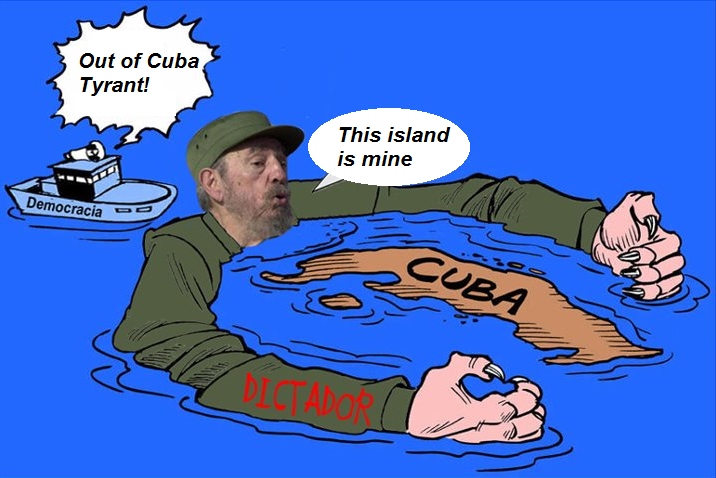 FACTS: One of the policy objectives of the Castro regime both internally and internationally is to portray itself as David against Goliath. Despite having normal trade relations, Hugo Chavez has undertaken the same kind of campaign in Venezuela without an economic sanctions in place. Often times the U.S. State Department has fallen short of explaining the sanctions policy fully or for that matter defending it in a vigorous manner at international forums. This has allowed the Cuban government a free hand in a sustained campaign to portray itself as a victim blaming all of its economic woes on the American blockade on Cuba. To believe that the regime would not continue its Anti-American campaign of blame with new grievances is naive. CLAIM #2: The embargo has hurt the Cuban people. According to both the Council on Foreign Relations and Global Edge remittances play a major role in the Cuban economy and have for some time. Reliable sources peg remittances total from $800 million to $1.5 billion per year, with most coming from families in the United States. During the Obama Administration regulations have been furthered loosened which means that this number may now be substantially higher. Medical equipment and pharmaceuticals can also be sold to the Cuban regime with the limitation that the goods don't go to the Cuban military or biotechnology industry and are not used for torture or re-export. During the Bush Administration the United States was Cuba's fifth leading trade partner and now is seventh in the world. CLAIM #3: The embargo has failed to remove the Castro brothers from power. FACTS: The embargo was not instituted to remove the Castro brothers from power. Due to the Bay of Pigs debacle that consolidated Castro's rule and the 1962 Cuban Missile Crisis that ruled out a direct U.S. invasion, economic sanctions were put in place not to eliminate the Castro regime but limit its ability to expand into the rest of the hemisphere and to force the Soviet Union to expend large sums in keeping the Castro regime afloat which ended up contributing to the USSR's demise in 1991 due to the economic dissatisfaction and hardship suffered by Russians. The Kennedy brothers sought other means to end the Castro regime in Operation Mongoose that were shutdown after Robert Kennedy left the White House in 1964. FACTS: Since 2000 U.S. businesses and farmers have sold $4,318,906.00 worth of goods to the Castro regime. Meanwhile countries that do not have sanctions in place, which includes restrictions on granting credits such as Russia, Venezuela, China, Japan, Spain, Argentina, France, Romania, Brazil, Italy, and Mexico are owed billions of dollars. Russia is forgiving $29 billion dollars of debt that the Castro regime owed it and Mexico is waiving 487 million dollars of debt owed by the regime in Havana. CLAIM #5: Castro never assassinated or tried to assassinate a US official. FACTS: Cuban spy network broken up by the FBI in 1998 planned terrorist actions on U.S.soil including the murder of a U.S. intelligence official in Florida. CLAIM #6: The embargo limits the civil liberties of Americans to travel to Cuba. FACTS: The U.S. Supreme Court on two occasion first in Zemel v. Rusk, 381 U.S. 1 (1965) in a 6-3 decision and secondly in Regan v. Wald - 468 U.S. 222 (1984) in a 5-4 decision affirmed that the State Department and the President can restrict travel under certain circumstances and does in fact limit the civil liberties of Americans. FACTS: In 2012 Cuban, Iranian and Venezuelan officials met in Mexico to discuss cyber attacks on U.S. soil allegedly seeking information about nuclear power plants in the United States. In 2013 it was revealed that the Castro regime was providing weapons and ammunition to North Korea in violation of international sanctions. The weapons and ammunition were intercepted in Panama when they tried to smuggle them through. Finally, the 1998 report, cited by Cato in 2005, and circulated over twitter today that claims that Cuba does not pose a threat to the United States was prepared by Ana Belen Montes, an agent of the Castro regime who successfully penetrated he highest levels of the U.S. intelligence apparatus and who was implicated in providing information that led to the death of an American soldier. U.S. sanctions policy with regards to the dictatorship in Cuba was about containment of the exportation of the Cuban model throughout the hemisphere, and during the Cold War having Cuba serve as a drain on Soviet resources that contributed to its eventual bankruptcy. In the post Cold War years it shifted once again with a focus on human rights. The failure of the United States to do this in China, Cambodia, Venezuela and Vietnam with their deteriorating human rights situation is regrettable. The policies in these other countries are profoundly immoral and ignore human rights concerns. Instead policies in China, Cambodia, Venezuela and Vietnam favor of short-term corporate economic interests that run counter to the interests of the majority of U.S. citizens not to mention the long term economic well-being of the United States. However, there are always opportunities for improving policies- in the case of Cuba- seeking out approaches that make the people, and not the dictatorship, the priority. For example on August 4, 2011 the Obama Administration announced a ban on visas for people who the State Department finds have been involved in human rights violations. Unfortunately, since then we have seen that human rights violators of the Castro regime are immigrating to the United States. If this ban were applied vigorously to the hardline elements of the Cuban regime it would be positive step that would protect dissidents by holding abusers accountable and providing a penalty, but this ban also needs to be expanded to follow the path taken by the European Union when dealing with the Mugabe regime in Zimbabwe. Banning the relatives of the hard line elements of the dictatorship from visiting the United States would create greater pressures on the regime for change. Unfortunately, what has gone on in practice is that the children and relatives of the hard liners have an easy time obtaining visas to the United States while the families of dissidents have a more difficult time. That needs to change for their to be hope that the President's Cuba policy have a positive outcome. Policy makers should take a closer look at Burma were a principled policy that included sanctions moved things in a positive direction. On International Human Rights Day the media was more interested in the handshake between the president of the United States and the dictator of Cuba at the Mandela memorial service. Searching google with "'human rights day' Cuba dissidents" provided only 50 results versus 72,400 results for "Castro Obama handshake" However, the massive crackdown in Cuba, at first garnered little attention, and what was reported low balled and trivialized what was taking place while offering a misleading analysis and questionable sources. Scores of activists detained and women activists badly beaten to the point of being hospitalized and requiring surgery for internal injuries was not deemed newsworthy by the Cuba based news bureaus or that two Argentine human rights defenders had been detained in the island for meeting with Cuban dissidents. The heightened level of repression appears to be in response to the increased number of activities by civil society to commemorate human rights day combined with the belief that they will not pay a political price for their repression. Some of these activities were small gatherings in a private home to observe December 10th. The level of violence visited upon activists such as Damaris Garcia of the National Resistance Front Orlando Zapata Tamayo who lives in Velasco, Holguin whose home was attacked with gas launched by regime officials because various activists along with an elderly woman and Damaris's young son had gathered there on December 10th to observe the anniversary of the signing of the Universal Declaration of Human Rights. The child was asphyxiated by the gas and is still suffering from complications. Meanwhile, in Puerto Padre, Las Tunas, dozens of members of the Christian Liberation Movement (MCL) were attacked with clubs, stones and tear gas as they gathered at the home of Roger Curbelo. Through their Facebook account, MCL members reported that police and "special forces" burst into the house, breaking the door and windows, leaving several injured and arrested, among others, Alexis Guerrero, Ismael Guerrero, Ezequiel Morales, Roger Curbelo, Ercilia Correoso and Armando Peña, who was later abandoned in an embankment far away from home. 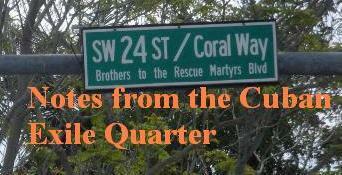 Over twitter initially and finally in The Miami Herald on December 12, 2013 the plight of Arlenis Pérez Alarcón, a member of the Ladies in White based in Santiago de Cuba was finally reported on. Arlenis was repeatedly kicked and stomped on during a confrontation between police and about 20 Ladies in White on December 10, 2012. She required emergency surgery on December 11, 2013 and was discharged the same day, despite her daughter's protests concerning the seriousness of her mom's injuries, late on Wednesday, due to pressure from state security. The statements made below by both the Reuters and Associated Press reports that there were "pro-government demonstrators", that "government employees mounted rival gatherings" and that a "hundred school children chalked peace symbols...and sang in a government-organized event," ignores the reality that Cuba is a totalitarian dictatorship and these activities are ordered from on high and orchestrated by state security agents. In addition that children are obligated to take part in these political activities which sometimes include acts of violence against nonviolent activists in order to be able to study at university and avoid themselves being targeted. In addition to these omissions the Associated Press report repeats the dictatorship's propaganda line against the Cuban dissidents and the dictatorship "organizing a human rights forum" without providing context or scrutiny. Excerpts are provided below along with links to the full articles. It is ironic that Al Jazeera provided more objective reporting, but they no longer have a news bureau in Cuba. Cuban government agents have detained about 20 dissidents arriving for an International Human Rights Day march, halting the demonstration before it started. The opponents were seen being taken away in cars and buses Tuesday afternoon after their planned protest along a central street in Havana was interrupted. The would-be protesters resisted, but no injuries were reported. It was not known where they were taken. Pro-government demonstrators gathered in the street to shout slogans for the Cuban revolution. Cuban authorities consider the island's small community of outspoken dissidents to be counterrevolutionaries and charge they accept foreign money to try to undermine the Communist system. The government marked the day by organizing a human rights forum that celebrated its achievements in providing citizens with social services and protections. Cuban dissidents and government employees mounted rival gatherings across the Communist-run Caribbean island on Tuesday, marking the 65th anniversary of the adoption of the Universal Declaration of Human Rights by the United Nations. While a handshake between U.S. President Barack Obama and Cuba's Raul Castro during ceremonies in South Africa honouring Nelson Mandela provided a moment of cordiality between the long-time foes, 15 Cuban dissidents held a seminar on human rights in the upscale Havana district of Miramar. Outside, a hundred school children chalked peace symbols on the sidewalk, danced and sang in a government-organized event. 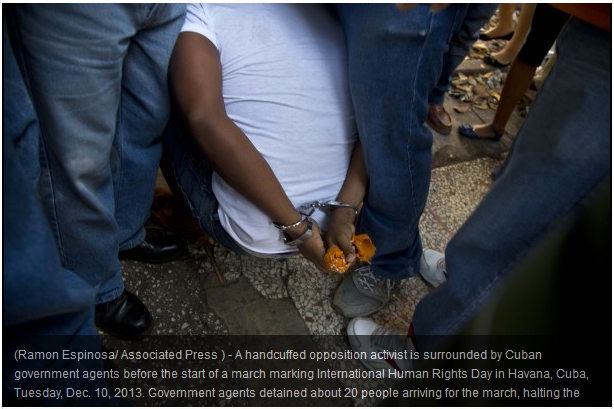 As many as 150 dissidents were arrested while trying to mark U.N. International Human Rights Day, the opposition Cuban Human Rights and National Reconciliation Commission said Wednesday. "As a preliminary figure, (there were) between 100 and 150 people arrested, not counting other forms of harassment or acts of vandalism. There was a lot of police violence all across the country," commission spokesman Elizardo Sanchez told Efe by telephone. Most of the international media relies on the reports of Elizardo Sanchez, but fail to qualify that 1) when Oswaldo Payá and Harold Cepero were killed on July 22, 2012 Sanchez was initially repeating the official government version that it was an accident. 2) The Christian Liberation Movement reported that "two days after the deaths Mr. Alejandro González Raga called them to transmit a message: Elizardo Sánchez says that for the well being of the family, that they accept that it was an accident. The Payá family in Havana received afterwards death threats by telephone from state security of the Cuban government." The failure to at least qualify the statements made by this individual in light of his past acts is disturbing. Furthermore that another human rights defender with a nationwide network who has been targeted with harsh repression, that Amnesty International said amounted to torture, Juan Carlos Gonzalez Leiva, is relatively ignored. Reports published by the news bureaus in Havana fail to mention the level of violence visited on Cuban dissidents. The fact that some had to be hospitalized because of the seriousness of their injuries was left out of their reporting or that this is part of a worsening trend seen over the past three years. Finally, it appears that the number of dissidents arrested greatly exceeds the 150 mentioned in press accounts. Democracy Now over twitter yesterday quoting the late Nelson Mandela raises a provocative question that deserves to be answered: "How many nations threatened by imperialism or fighting for their freedom have been able to count on Cuba?" A series of slogans began to be put forward and in fact certain measures were taken such as the establishment of the bourgeois "freedom" of the press. This means that the counter-revolution and the exploiters, the very enemies of socialism, were granted the right to speak and write freely against socialism. Emperor of Ethiopia Haile Selassie I served first as regent of Ethiopia from 1916 to 1930 and was emperor from 1930 to 1974. He was the heir to a dynasty that traced its origins to the 13th century, and from there by tradition back to King Solomon and the Queen of Sheba. At the League of Nations in 1936, Emperor Selassie condemned the use of chemical weapons by Fascist Italy against the people of Ethiopia. Emperor Haile Selassie's internationalist views led to Ethiopia becoming a charter member of the United Nations, and his political thought and experience in promoting multilateralism and collective security are still viewed as part of his enduring legacy. Despite inspiring the founding of a religion that today has up to 800,000 followers he remained an Ethiopian Orthodox Christian. Emperor Haile Selassie was deposed and killed in a military coup and it is believed that the officers smothered him and that Mengistu Haile Mariam: "ordered the emperor's body to be buried head down in the palace and had a lavatory erected over the grave so that he could express daily his contempt for the monarch." Castro also supported the suppression of the Eritrean national movement in the 1970s. Beginning in late 1977, the first 5,000 of what would eventually number over 17,000 Cuban military personnel arrived in Ethiopia. By 1987 the Cuban presence had dropped to fewer than 2,000 personnel. During 1977-78, a conservative estimate of over 30,000 Africans perished as a result of the Red Terror unleashed by the Ethiopian Communists and their Cuban allies. Amnesty International concluded that "this campaign resulted in several thousand to perhaps tens of thousands of men, women, and children killed, tortured, and imprisoned." Sweden's Save the Children Fund lodged a formal protest in early 1978 denouncing the execution of 1,000 children, many below the age of thirteen, whom the communist government had labeled "liaison agents of the counter revolutionaries." Mengistu Haile Mariam was aided by the Castro brothers. Mengistu was found guilty of genocide on December 12, 2006, and was sentenced to life in prison in January 2007. In 1980 Fidel Castro supported the Soviet Union's invasion of Afghanistan. This placed him in a very difficult situation at the time as the head of the non-aligned movement. 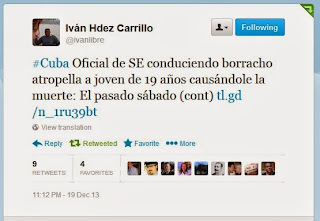 In Cuba the regime delayed reporting in the official news on the invasion for days. The historical record demonstrates that both Fidel and Raul Castro were lap dogs of Soviet Imperialism during the Cold War. Their efforts in Africa should be looked at within the Cold War context. The Castro brothers have been consistent in their anti-Americanism but not in their anti-Imperialism. It was not the first time that a U.S. president had shaken hands with a dictator named Castro. Bill Clinton did it first in 2000 at a U.N. Summit in New York City shaking hands with Fidel Castro. However falling on International Human Rights Day in the midst of a human rights crackdown in Cuba, the symbolism this time around is even more unfortunate. The attempt by the press to portray this encounter as "in the spirit of reconciliation" while ignoring the ongoing crackdown; Alan Gross, the American citizen held hostage in Cuba; and the demands for justice from the families of murdered human rights defenders Oswaldo Paya and Harold Cepero is a depressing commentary on the quality of press coverage in the 21st century. Reconciliation not only implies some measure of justice but also of repentance on behalf of the wrong doers and recognition that they have done something wrong. To speak of reconciliation on the same day that human rights defenders are being rounded up and beaten up in Cuba is a travesty. It is nearly on the same level as those in media trying to portray Nelson Mandela as some sort of pacifist which he was not. Unlike many in the world today, Havel defended human rights even when it challenged the powerful whether it be the economic giant of China or the United States and he was a constant ally of dissidents the world over until the final day of his life. Havel considered Nelson Mandela a friend but he would never re-write who the man was to make him more palatable for mass consumption. TR @ivanlibre #Cuba in Havana a large paramilitary operation at different sites around homes of @DamasdBlanco who are preparing to go out. TR @felixncuba #HumanRightsCuba Jose Diaz Silva & other emergent civil society members in Havana are DISAPPEARED & homes under seige S.O.S! There are too many leaders who claim solidarity with Madiba’s struggle for freedom, but do not tolerate dissent from their own people. And there are too many of us who stand on the sidelines, comfortable in complacency or cynicism when our voices must be heard. The death of Martha Frayde Barraqué, a founder of the Cuban Committee for Human Rights on December 4, 2013 , a day prior to Mandela, in relative obscurity despite her powerful moral example is tragic. Rafa Rubio, a Spanish activist summed it up best over twitter: "Sometimes I think if Mandela were born in Cuba he would have died forgotten in jail or in exile." Despite the numerous claims equating Nelson Mandela with Gandhi and Martin Luther King Jr., he was not a prisoner of conscience because he advocated violence for decades and refused to renounce it even to gain his freedom. Despite the claims of ardent revolutionaries this did not speed up the end of Apartheid, but to the contrary may have lengthened the life of that evil and racist system. Mandela's story is that of a man who joined a nonviolent struggle, turned to violence and after failing to succeed with violence for many years returned to nonviolence and achieved change. Colleagues in the Cuban opposition who are holding up Mandela as an exemplar may be tempted to use violence. Presently, in Cuba there is a large nonviolent opposition movement that has suffered and continues to suffer the violence of a 54 year totalitarian dictatorship. Prominent opposition activists have been murdered by state security agents, and like Mandela some may be frustrated by the pace of nonviolent change. Believing violence to be a short cut may opt to follow Nelson Mandela's example. They would be mistaken to believe that violence will speed up the walk to freedom. Phase 1: Strategic uncertainty in which the nuclear deterrent capability will not be acknowledged or denied. 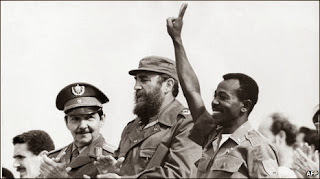 Phase 2: Should South African territory be threatened, for example, by the Warsaw Pact countries through the surrogate Cuban forces in Angola, covert acknowledgement to certain international powers, e.g. the USA, would be contemplated. Phase 3: Should this partial disclosure of South Africa's capability not bring about international intervention to remove the threat, public acknowledgement or demonstration by an underground test of South Africa's capability, would be considered. The response of the Apartheid regime was not to buckle to the violence of the African National Congress but to escalate. The following decade saw many more massacres of the black majority by the apartheid regime, the forced resettlement of three million people to the "black homelands", more than 600 killed in clashes, and greater repression against the black majority. "Together, hand in hand, with that stick of matches, with our necklace, we shall liberate this country." The Truth and Reconciliation Commission "concluded that she had personally been directly responsible for the murder, torture, abduction and assault of numerous men, women and children, as well as indirectly responsible for even larger number of such crimes." This is where Mandela's call to violence and alliance with the Cubans and Soviets led: to the white minority government responding to the threat with the development of six nuclear weapons and his own wife engaged in the murder of women and children. He may have not been directly involved but the advocacy and legitimization of violence and his steadfast defense of that position over decades had consequences. It was not this violence that brought an end to Apartheid but nonviolent actions inside and outside of South Africa. The nonviolent Solidarity Movement in Poland set off a chain reaction of nonviolent change that spread across Eastern Europe in 1989 and ended with the peaceful implosion of the Soviet Union in 1991. Inside South Africa labor strikes began to have an impact and in coordination with an international boycott campaign made great impacts in South Africa. On the face of it the collapse of the East Bloc and the Soviet Union should have been at least indirectly positive for the South African Apartheid state which had as its principle adversary the African National Congress that had relied heavily on the Soviet Union and their Eastern European and Cuban satellites that aided Mandela's movement. 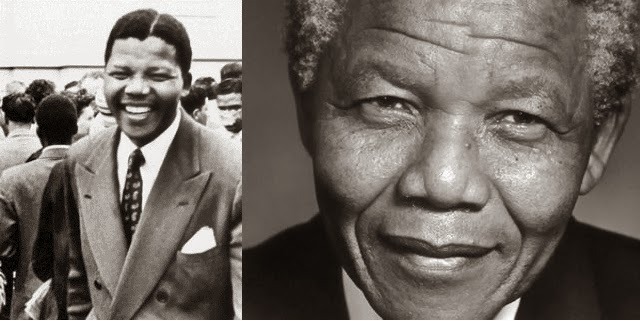 Mandela was a man who joined a nonviolent struggle to end Apartheid and turned to violence to break the will of the South African regime in 1961 and would beginning in 1964 spend the next 27 years of his life in prison but finally rejected violence as a political tactic because he had no other alternative. With the collapse of the Soviet Union and the East Bloc the African National Congress (ANC) no longer had a weapons supplier. With the fall of the Berlin Wall and the collapse of the Soviet empire the African National Congress's military option was taken off the table, and this allowed negotiations and non-violent action to achieve what political violence had not done in three decades: an end to the racist apartheid regime and Nelson Mandela as president of a multiracial South Africa. It is not a coincidence that the decision by the Apartheid regime to scrap the nuclear weapons program and dismantle its bombs was made after the Berlin Wall fell in 1989. On 9 November 1989, twenty years ago, the Berlin Wall cracked open, the Cold War in Europe came to an end, the Soviet empire tottered to its grave and the ANC military option lost whatever teeth it might have had. The military/security state erected by the National Party never lost a centimeter squared of its soil. Umkhonto weSizwe, the military wing of the ANC and the South African Communist Party, never won a centimeter squared of soil. True, the repeated mass mobilizations and popular uprisings within South Africa through the Seventies and the Eighties placed a colossal strain upon the regime, and, true, the economic strain upon the state - especially in conditions of attrition exercised against it by the US banking system - placed it under further serious pressures. Nevertheless, honest accounting must say that, given the continuation of the Cold War system in Africa, this nuclear-armed state at its southern tip was nowhere near collapse. The Anti-Apartheid movement was without an international backer and had run out of weapons and ammunition. What remained was the international grassroots campaign, boycotts, economic sanctions, and a nonviolent movement internally that could coordinate strikes and raise the consciousness of the black majority. This is what brought the South African government to the negotiating table. If the black majority refused to cooperate with their oppressors the system could not be maintained. At the same time the collapse of the international communist threat made it easier for them to negotiate without the fear that they would wind up in the Soviet orbit. Amnesty International adopted Nelson Mandela as a "forgotten prisoner" following his arrest and conviction in 1962 for alleged passport violations. In 1964 he spoke in his own defense at the famous Rivonia Trial and explained why he had chosen to organize an underground army (MK) and plan a campaign of violence directed towards the end of overthrowing the apartheid regime. Mandela's open avowal of chosing to use violence to further political ends caused a split within the ranks of Amnesty International, which at the time was very much smaller than it is now. One group advocated continuing to work unconditionally for Mandela's release, while the other urged that AI should adhere to its own principle and restrict it's efforts for unconditional release only to those political prisoners which they termed "prisoners of conscience" -- those who had neither used nor advocated violence. This would exclude Mandela from POC status, but would enable AI to continue to work on his behalf in terms of fair trial, and against the possibility of the death penalty. This issue was debated at length at the 1964 congress in Canterbury England, and it was decided there in favor of the second position -- that is, not to make an exception for Mr Mandela. I would recommend that readers interested in the details and in the early history of Amnesty International should get ahold of a copy of Egon Larsen's --A Flame in Barbed Wire -- (New York: W.W. Norton, 1979). By the way, Amnesty International takes no official position on the justification of the use of violence. It only makes a distinction between those political prisoners who do and do not use or advocate its use as concerns its internal program of action on their behalfs. President Mandela has long since acknowledged that Amnesty made its decision in good faith, and has thanked the organization for its work on behalf of thousands of other South African prisoners and detainees. For example in South Africa Steve Biko was identified by Amnesty International as a prisoner of conscience whereas Nelson Mandela was not. Biko was murdered by the Apartheid regime because his nonviolent black consciousness movement threatened the Apartheid regime as much or more than Mandela's violence. Nonviolence is not passive but active and resists injustice. Mandela in his 1964 speech failed to understand the power of nonviolent resistance. Since then the evidence has only increased that the more violent and extreme the regime the more successful nonviolent resistance to it and counter-intuitively the less successful violent resistance. The greatness of Nelson Mandela and the reason that the world has honored him and will continue to for years to come is that once he made the return to nonviolent resistance and negotiation to bring an end to the Apartheid regime for strategic reasons he did not abandon the principles of nonviolence and reconciliation when dealing with his adversaries when he assumed power in a post-Apartheid system. As the country's first black president, he consistently preached national unity, sometimes to the point of irritating the country's blacks, who felt he was too conciliatory. And on a continent where many leaders rule until they are overthrown or die, Mandela served just one five-year term beginning in 1994 and then retired in 1999. This is why Nelson Mandela is considered by some a heroic figure and will be remembered in the history books. He gave up power. Mandela could have easily followed the path of Mugabe or Castro and declare himself president for life. Remarkably, his links to the Communist party, Fidel Castro and other unsavory types who have done great harm elsewhere in Africa but assisted him in the violent struggle did not lead Mandela to following their dictatorial ruling style. Furthermore 27 years in prison and a life time in a profoundly racist society did not embitter him with the white minority. "He was a man who knew how to move politically from positions of armed violence to reconciliation and peaceful coexistence among opponents before confronted in hatred. He called a tyrant like Fidel Castro "my President" and always ignored the fate of peaceful activists for democracy in Cuba. He was an inclusive President, generous and pragmatic that looked for the reconciliation of the entire South African nation. His achievements gladdened me, his inconsistency, born of political debt that he owed to the Cuban regime, caused me grief, it impeded me from believing in his good intentions more than in his pragmatic sense...Rest in peace Nelson Mandela"